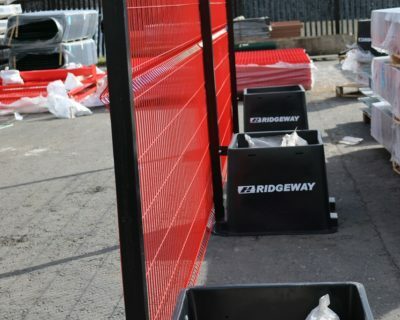 Here at Ridgeway we have a fantastic range of temporary fencing panels. Our Ridgefence range can be used to protect building sites and empty properties. They have been on the market for over 20 years. Ridgefence represents our ability to successfully introduce new products to the local market and sustain their development. Our Ridgefence panels offer the strongest joint system on the market. Our Ridgefence temporary fencing panels provide a secure and strong fencing system that can be installed quickly and easily. It has proven very popular in the construction and event management industries. They can be used as site demarcation, directing people away from construction hazards or towards secure areas. Ridgefence Temporary Fencing is heavy duty 38mm diameter fully framed panel. They are constructed using only 2 tubes plus optional centre bar for the ultimate temporary panel. This has the added feature of only having 2 corner joints and hence only half the potential for joint damage. The rounded corners offer the client a more aesthetically pleasing appearance to their perimeter fencing. Ridgefence Barricade Panel Hoarding System is a heavy duty panel system similar in concept to mesh panel temporary systems. They adopt various erecting options from rubber block with ‘windjammer’ backstay to Scaffold Tube and coupler dig system. Available in galvanised ex-stocks this high volume cost effective system allows fast installation and works extremely well with mesh systems. Pedestrian and double gates are also available. Here at Ridgeway we offer a complete corporate image package for colour coding and sign printing to suit clients professional look and market appeal for selling for in progress building sites. Our Ridgefence Steelhoard is a unique patented heavy duty steel hoarding. It offers flexibility and longevity of life over traditional timber based site hoarding. 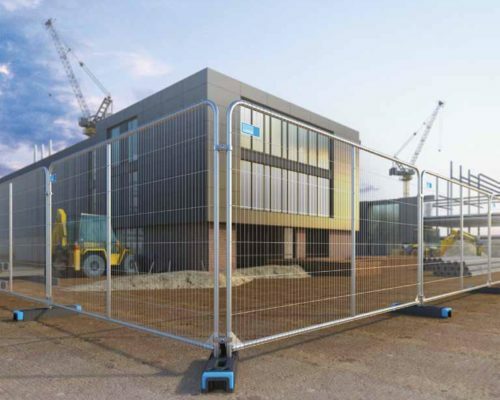 In particular its lifespan and reusability are attractive to main contractors wishing to highlight their high profile corporate image whilst providing maximum temporary security. They are easily stacked, stored and transported. FenceSafe, it is a secure temporary fencing system suitable for the construction, retail and event industries. It has zero external site footprint. The FenceSafe system is manufactured to BS6399:1997. FenceSafe is made from 5mm Rigid Mesh Wire. This offers a more secure panel with anti-climb features. It is made from 100% recycled plastic and 90% recycled steel that can also be converted to a permanent fencing solution at the end of the project meaning only one type of fencing is required. Slot Block Barriers are a revolutionary site safety barrier. 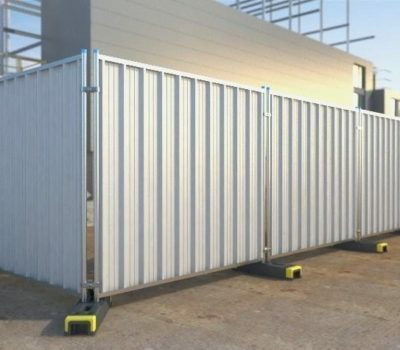 They are the only water filled barrier to hold a standard temporary fencing panel to increase site safety, virtually eliminate potential trip hazards and give added stability to fence panels. They have been independently tested by MIRA testing. 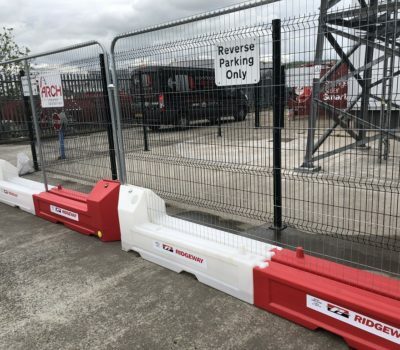 Slot Block Barriers will save time and money with the constant re-erection of the site fencing and will give added visibility and corporate identity on ‘high profile’ sites. Contractors using Slot Block Barriers will dramatically reduce their working footprint by an average of 500mm against a standard fence block. Please click here to view are full range of temporary fencing products.